Taking a quick break from the Sunshine Garden Scrapbook Pages....I thought you'd enjoy this Kids Craft Project we recently did. Cut 4 squares of Whisper White 1/8 larger than 5-1/4 x 5-1/4. Then cut two 5-1/4 x 5-1/4 patterned pieces of Baja Breeze Print Patterns paper. One for the front cover, one for the back cover. Adhere the 2 pieces of 5-1/4 x 5-1/4 pieces of Baja Breeze DSP to the front and back Whisper White pieces. Punch one side of each (of the 4 pieces used for the front and back covers) using the Spiral Punch. Adhere to front, inner-front, inner-back, and back covers using SNAIL adhesive. Cut the Freshcut Notes card front to 3-1/4 x 3-1/4. Lay it down in the center of the journal. 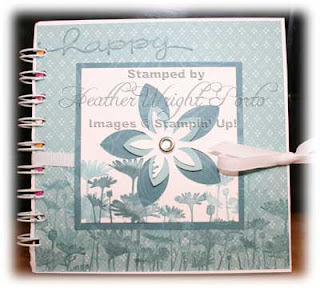 Then stamp the front cover with the Upsy Daisy (flowers) in Baja Breeze ink. Then stamp again with Blue Bayou. Wrap around a piece of ribbon to be used to close the journal. You can use SNAIL adhesive to hold down the ribbon as well. Now lay down a 3-1/2 x 3-1/2 piece of Blue Bayou Print Patterns Designer Series Paper. Pierce a hole in center of the Freshcut Notes. Pierce a hole in the center of a punched 5-petal flower (Baja Breeze Prints Paper which is more solid). Place the punched flower behind the Freshcut Notes. Then place Circle Rhinestone Brad thru the center of both. Adhere to Blue Bayou square using SNAIL adhesive. Stamp "Happy" or desired greeting in the upper left corner area. Enjoy! More Kids Craft Projects coming since I am holding "Get Creative" classes every Monday for 3 weeks.